Shiratamako; the taste from rich soil. With sticky chewy texture of rice cake and deep sweetness of grain. To keep the natural ecological system as it is, no chemical fertilizer, chemically synthesized agrichemical and herbicide are used. 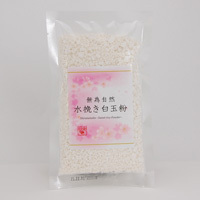 This Shiratamako (sweet rice powder) is made slowly and with effort in a traditional way, “Mizu-biki way”, using sticky rice grown by universe along natural ecological system. This fine and smooth, rich nutritious rice flavour, brings out the flavour of Japanese sweets. Grinding Shiratamako into powder and make Japanese radish sticky cake. Mixing with grated potato and make chewy texture cake. Or making Shiratama dumplings by mixing it with tofu. Up to your ingenuity, you can give chewy texture in your usual dishes. This is the way of production; soak sticky rice in water overnight, and grind it together with water by a stone mill. After it gets powder, put it in water, then it will get sediment. Squeeze the sediment and dry it. Finally, traditional way of Shiratamako (sweet rice powder) is ready. By putting in water, we can reduce the damage from frictional heat from stone mill. and also surplus of hydrosoluble protein melts out in water. 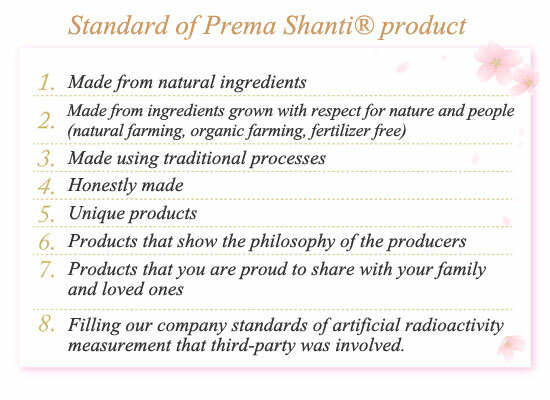 Thus we can get Shiratamako with high purity of the starch. Add about 110cc water little by little against one pack of this Shiratama flour (120g). Make knead the dough well by hands until it gets ear lobes softness. When enough water in a pan get boiled, cook Shirama balls which are shaped round as big as you want. After those balls are coming up on the surface, keep boiling about 1-2 minuits as it is. Then, scoop them up and put them into cold water. When the temperature get low, drain water well. Serve them together with fruits punch or ice cream. Or also good to eat with Mitarashi-dango (skewed rice dumplings in a sweet soy glaze). *Keep in airtight container after opening to avoid moisture absorption and insect damage, and consume shortly.